Make your character run using the left and right arrow keys. Hit the up arrow key to jump. Block by pressing the down arrow key. 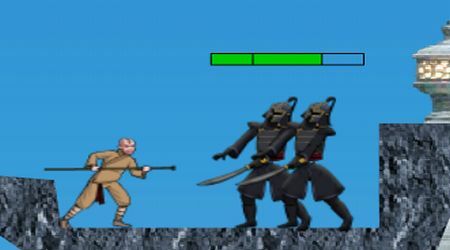 Click the left mouse button to attack an enemy. When your blue power meter is full, hold down the left mouse button to do a special attack. The longer you hold down the left mouse button, the more powerful your elemental attack will be. Collect all the required tokens for each level to be able to move on to the next one.